Today is another day of cleaning and packing. Before getting back to the packing job we decided to pack-up all our samples, get them into the dry liquid nitrogen shipper (See previous discussion in this blog.) and attempt to send them home. If you recall we were concerned about this because the only shipper in Barrow, Northern Air Cargo, has temporarily lost their license to ship hazardous. Nothing about our samples is hazardous, but we were unable to procure official paperwork that documents this. Anyway, we thought it was best to ship as early as possible just in case we ran into a problem. Also, the earlier in the week that we ship the more likely it will be to have it arrive during the working week when there will still be someone at our home labs to receive them. So first thing this morning we packed up the samples and went to the NAC offices. They didn’t even blink an eye. So the samples we collected are now headed home to Savannah and we didn’t have to worry at all. After our success at the NAC office we returned to continue packing. Our goal is to have everything organized and next to the packing crates where we will store them. Midway through the afternoon another group of scientists from Columbia University’s Lamont-Doherty Earth Observatory, who are investigating ice algae, arrived and began to set-up their labs for a month long visit. As is usual in scientific circles, it didn’t take long for us to find many common interests. I was also very excited that, among their gear, they had brought some nice microscopes and agreed to let me use one to look at some water samples. Earlier in the week Lollie and Adriane, while filming with their underwater cameras, captured images of something that I couldn’t identify. They looked like they might be very large algal cells and one thought I had was that they might be ice algae beginning to bloom in the Arctic spring. Mystery objects from under the ice. Frame capture from video shot by Lollie Garay. I showed the video to the Juhl group, but they were a mystified as we were. We came to the conclusion that perhaps they were developing eggs or larvae of something undergoing a mass spawning event. Unfortunately we don’t have a way of determining the size of objects in the images which might help us indentify them. Lollie is working on figuring this out though, so we should be able to determine size. Although the Juhl group had brought some nice microscopes,since we didn’t have fresh water samples our examination of water samples were also inconclusive. If anyone out there recognizes these objects please let me know. After this pleasant diversion it was back to packing. Tomorrow all that is left is to clean-up the equipment and supplies that we are still using for Zac’s thesis experiments, finish our inventories, seal the boxes, and put them back into storage. Speaking of Zac’s experiment, after packing and chatting with the Juhl group, it was time for us to take our last samples from those experiments. The incubations lasted for 6 days and we’re hoping that that will be enough time for us to see the effects of humic additions on bacterial activity, growth, and utilization of nitrogen and carbon. The samples are now all collected and Zac will be analyzing them over the next couple of months. We’re holding our breaths for the results. Zac’s experiment. Bacteria inoculated filtered seawater with added humics (1), humics and organic nitrogen (3), glucose (5), and seawater only (7). Each bottle was duplicated, but only one is shown in this photo. Note that bottles containing humics are considerably darker than those not receiving humics. The bottles were incubated in the dark at just over freezing temperatures. Finally, we are completely done with all our science activities and it was time for a celebratory dinner. We invited the Juhl group to come with us to try out a relatively new Chinese restaurant in town; Sam and Lee’s. It was fantastic, better than any Chinese restaurant in Savannah in my opinion. I had a spicy duck dish that was both delicious and copious. I took home a doggie bag for lunch for tomorrow. Today was our last full lab day and the beginning of the end for this trip. After breakfast in the cafeteria, Zac and I began to purify bacterial messenger RNA (mRNA) from the water we had filtered yesterday. mRNA is the molecule that acts as the intermediate between DNA and proteins. All the information necessary to code for complex macromolecules like proteins are stored in DNA, but in order to use those instructions a cell must transcribe its DNA information into RNA that can then be translated by another complex molecule called a ribosome into proteins. Truly life is amazing and it boggles the mind how complex and elegant it is. From the very smallest scale of atoms and molecules to the grandest scales of the universe, everything is connected. Anyway, I digress. Our goal today was to purify RNA from the bacteria that we had captured on our filters so that we can determine which genes are turned on and how active those genes are. 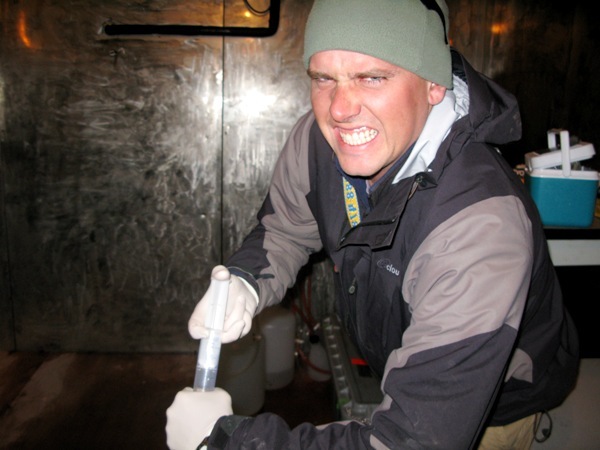 We are particularly interested in those genes that bacteria use to assimilate inorganic nitrogen because we suspect that the addition of new carbon in the form of the humics released from the melting permafrost will require bacteria to use more inorganic nitrogen. If this is true we should see an increase in the genetic expression of the genes involved in inorganic nitrogen assimilation. Anyway, that’s why we need the RNA. The initial step of our purification procedure requires two sets of hands and that was my job this morning. Once we had safely gotten our filters containing all those bacteria into the first extraction reagent which stabilizes the RNA I was free to start packing-up our labs while Zac completed the RNA extractions. I started with the cold room where we had filtered all the water. Although it took us many hours to set-up the lab and to make sure that we had everything in exactly the right place, it only took me about half an hour to dismantle it. 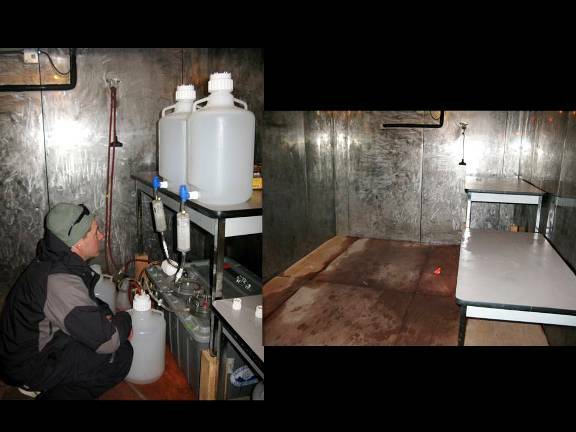 Cold room during use and after being cleaned-up. It’s kind of sad to tear down a lab that was so functional, but we know we’ll be back in the summer to do it again. Just for grins we left one little piece of orange tape on the floor to see if anyone else uses the space before we get back. Once Zac finished the purifications we really got busy rinsing and cleaning all our gear and getting everything ready to be packed away. At around 3pm we stopped to sample Zac’s ongoing experiment; there’s only one more time point to go in that study. Then we went to help Lollie pack her bags and get checked in for her flight home. Because the airport here is so small but still requires the TSA agents to screen all bags, travelers are encouraged to check in early. This greatly reduces the check in wait times and relieves congestion in the very small arrival/departure area. 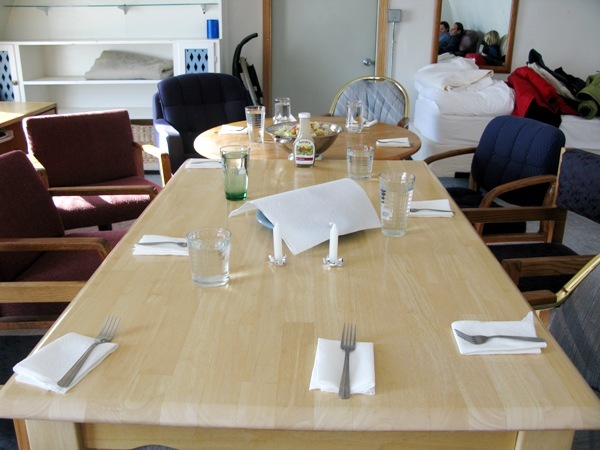 After Lollie checked in she went back home and finished preparing a fabulous Mexican dinner for the whole team. Alas all good things must come to an end and finally it was time for Lollie, Adriane, and Debbie to head back to the airport to start their long journeys home. We miss them already. 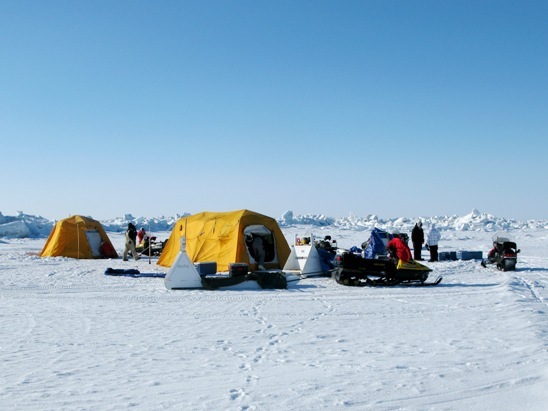 With our new ice camp all set-up yesterday, this morning we were ready to go back out on the ice to collect our last set of samples for the trip. When we left building #36 it was foggy with a few snow flurries and it was a relatively warm -8.9°C (16°F). 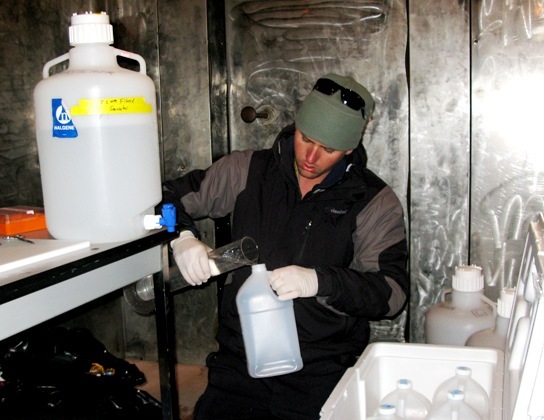 By the time we got out on the ice and waited around, (Brower, one of the members of our logistics crew, went back to pick-up the electric generator that we forgot and that runs our sampling pump.) the sun came out; the wind picked up; and the temperature dropped. Again it was breath takingly beautiful, but it felt considerably colder. We passed the time waiting by hanging out in the tent, eating pretzel m&m’s that Steven had brought but that we ate all up before he could get any, and telling stupid jokes. Did you hear the one about the baby polar bear that didn’t think he was a polar bear? Why don’t you think you’re a polar bear the polar bear daddy asked? Because I’m fricking freezing said the baby polar bear! Yeah, not so funny but it passed the time. Soon Brower had returned and we were back in business. We quickly collected our water and loaded it on the sleds. All week we’ve been having trouble trying to keep our heavy coolers filled with water from falling off the sleds. Today was no different. No more than 2 minutes after leaving, we noticed that our coolers were about to slide off. We stopped and re-tied them properly. The trick is not to pile them up on each other but to spread them out on the sled. Of course we figured this out on our last trip of the expedition. After re-tying our sled we made it back to our lab without incident and quickly began processing the water. The right way to load a sled. After working out all the little filtration problems with the previous two samples, everything went smoothly. It kind of reminds me of making pancakes. Have you ever noticed that no matter how many times you’ve made pancakes before, the first batch always turns out funny? It seems like the same is true for filtering water. We finished in record time and were able to sample Zac’s experiment a little early. This made Tara and Karie happy since they are helping us measure the activity (productivity) of the bacteria, and this involves a 4 hour incubation step. The sooner we get them samples the sooner they can go to sleep! Still, I missed lunch and working on the ice and in a cold room just a touch over freezing all day sure does build-up an appetite. At the cafeteria they were serving Beef Burgundy one of my all time favorite meals. Boeuf bourguignon it was not, but it sure was tasty, warm and completely satisfying. 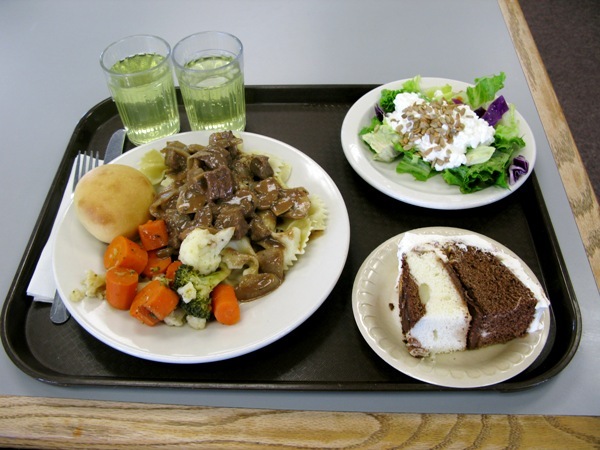 Beef Burgundy dinner at the Ilisagvic college cafeteria. After such a huge meal and long day I went back to my room planning to catch-up on computer work and to go to bed early. But at around 10:30 Zac and Steve called me to tell me that they were heading into town to hear a local band that was playing at the roller rink and did I want to join them? The band is called “The Barrow Tones.” Now how could I pass that up? So we picked-up Adriane who also wanted to go and off we went to find the roller rink. When we arrived, we learned that the band wouldn’t start playing for another hour and that was just a little too much for us. However, we didn’t leave before hearing the band rehearse and soaking in the scene. Think heavy metal in a 1970’s disco. Instead of enduring that, we retired to Steven and Zac’s hut for Mint Milano cookies and quiet conversation. Still, it was well past 1am by the time I got to bed. Today was another lab day, and although our special pipettes still hadn’t arrived we felt we had to go ahead and process our RNA samples. 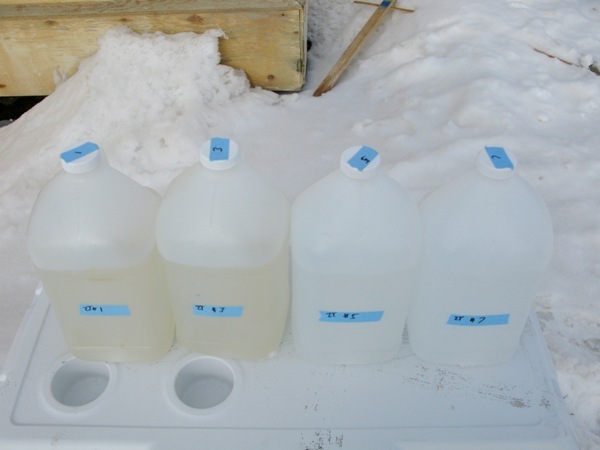 During our first trip to Barrow last spring we had experimented with holding these samples until we got home before processing them. The results were not good, and so we decided that we had to process the samples as soon as possible after they were collected. We felt it was risky to even holding the samples a single extra day so we moved ahead using our back-up pipettes. But can you believe?! 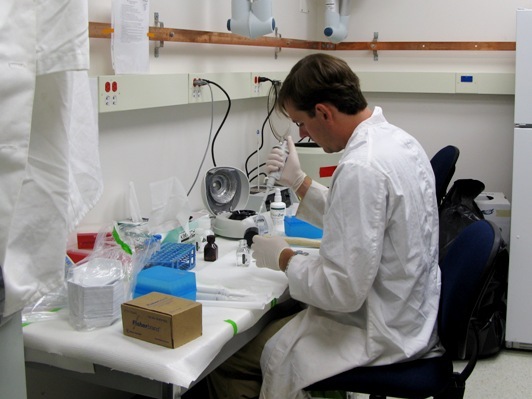 Exactly as Zac was finishing-up with the extractions the pipettes were delivered. The only saving grace was that both Zac and I had both missed lunch and when we unpacked the box and found the Twizzlers and peanut m&m’s that Victoria had used as packing material we were thrilled. Thanks Vic! While Zac was hard at work in the lab purifying RNA, I spent the morning and most of the afternoon out on the ice helping to move our ice camp. During our last trip in January we were unable to reach our primary sampling site about 1.5 miles offshore due to ice conditions and the lack of a suitable ice trail, so we had to settle for a location closer in. The water there was quite a bit shallower. 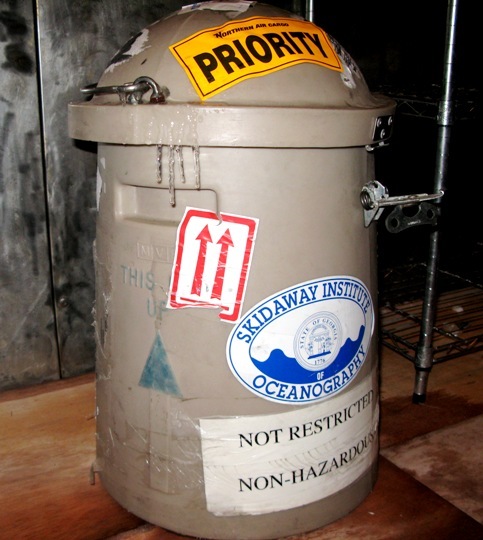 Although all our measurements indicated that we still were in oceanic and well-mixed water, we can’t be certain that we can directly compare the data from that site to all the rest of the data that we are generating. So during the planning for the current trip we had decided that if we managed to get two samples from our primary site and we still had time during this trip, that we would move our camp and sample from the more inshore location. Sampling both locations at essentially the same time will allow us to directly compare results from both the near shore and offshore locations. We’re hoping they are similar! 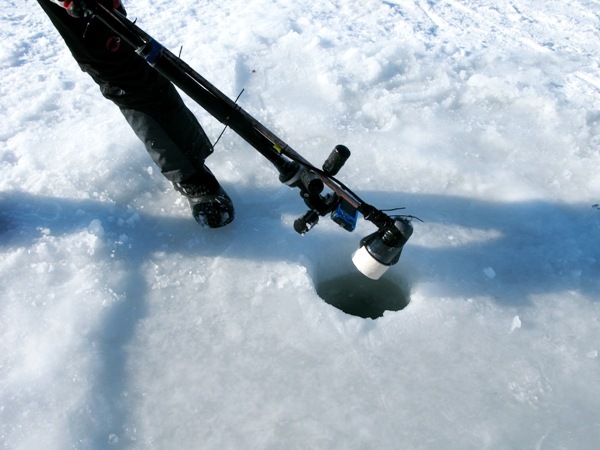 All has gone well, so today we began to implement our decision and moved our ice camp inshore. 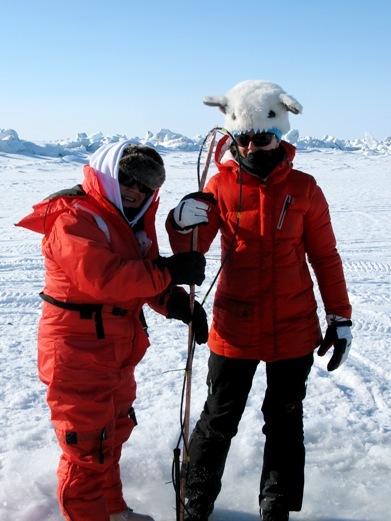 With Rachel Siple, myself, and the UMIAQ crew, we headed out on the ice. Reaching our destination we drilled an exploratory hole in the ice and measured the water depth and ice thickness. We’re really looking for 10 meters of water, but our minimum is 8. Unfortunately at the first hole we drilled we only had 7M of water so we were a bit disappointed. From experience we knew that the bathymetry in this area is highly variable so we moved about 30 meters from the first hole and drilled another. At this location we measured the water depth to be a little over 8 meters. Although marginal, it met our criteria. We are still hoping to find a better site. We got back on our snow machines and moved to the other side of a very large ice ridge and drilled a third exploratory hole. Alas, the depth was even less there so we decided to go ahead and set-up camp at the second place we looked. Setting up an ice camp. 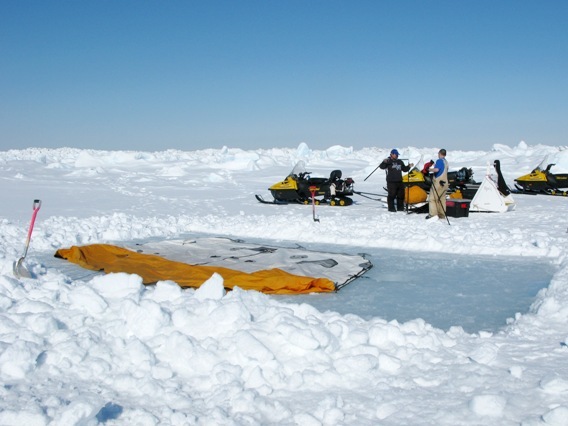 Setting-up camp involves removing the snow from the area (lots of shoveling); positioning holes for the pump inlet and outlet (for the big tent) and a large hole to accommodate the Niskin bottle in the small tent; and documenting water depth, ice thickness, water temperature, salinity, and light attenuation. 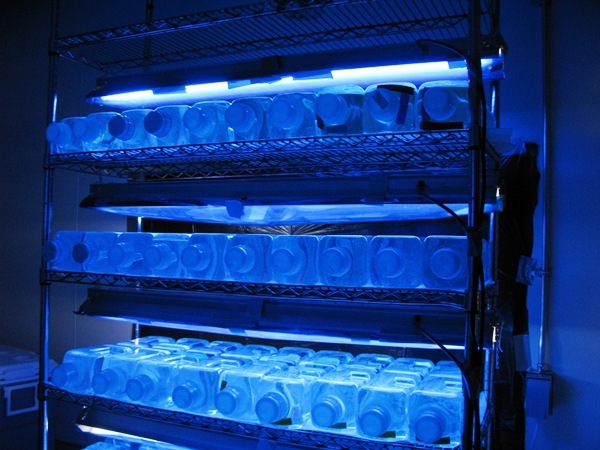 It’s especially important that we know light attenuation since we need this information in order to set-up our incubations back in the lab and to decide at what depth to sample. All this was pretty hard, manual labor and, to my surprise, I found myself sweating and discarding some of my layers of clothes despite the cold temperatures. 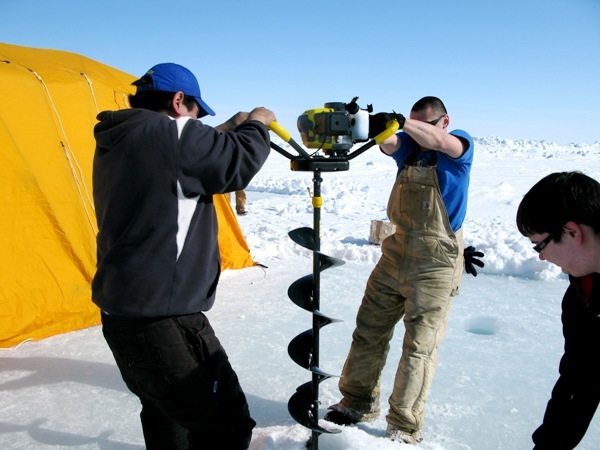 Drilling a hole in the ice. Drilling all those holes was especially hard work and made me appreciate more than ever the support we are receiving from our UMIAQ logistics team. While drilling one of the holes we had a visitor from a ctenophore. I sent this picture to a colleague Jenny Purcell and she identified it as Bolinopsis infundibuluma common Arctic species of ctenophore. The Arctic ctenophore Bolinopsis infundibulum. 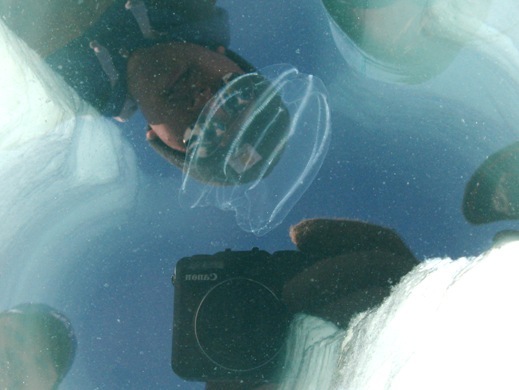 Jenny is a world renowned jellyfish authority from Western Washington University. Ctenophores, commonly known as comb jellies are almost all predators that feed on small zooplankton. Their most distinctive features are their “combs” which consist of cilia that they use for swimming. Interestingly, ctenophores are the largest animals that swim by means of cilia. Bolinopsis is commonly found throughout the Arctic Ocean in the upper 500 meters and subsists on small zooplankton species like copeopods. Undoubtedly this individual was enjoying eating all the organisms growing at the bottom of the ice pack and we must have disturbed his/her lunch when we drilled our hole. I say his/her because Bolinopsis is a hermaphrodite. By about 2pm we were finished and headed back and I arrived just in time to watch Zac finish his lab work and eat Twizzlers. For dinner Steven Baer (a Ph.D. student with Debbie Bronk) and I had planned a Shabbat dinner for everyone. We are Jewish and enjoy the ritual of Shabbat that marks the end of the week and gives us all a moment to stop and reflect on the many blessings of our lives. Steven prepared an awesome dinner of pasta primavera and hosted us all to dinner. Steven had also brought candles from home and I managed to bring a bottle of wine. Because we can’t buy wine (or any alcohol) in Barrow (at least not legally) I had to smuggle it in. In the local grocery store we found a loaf of bread that resembled a Challah. Challah is a type of bread traditionally served at festive Jewish meals. So, with everyone in attendance we took a moment to pause our work, say a few prayers, and enjoy a fantastic meal together. It didn’t last long though since most of us had to run off to finish something or other, and to get ready for tomorrow’s sampling expedition. But at least it was a moment. After our relatively slow day in the lab, today we were back out on the ice collecting another set of samples. 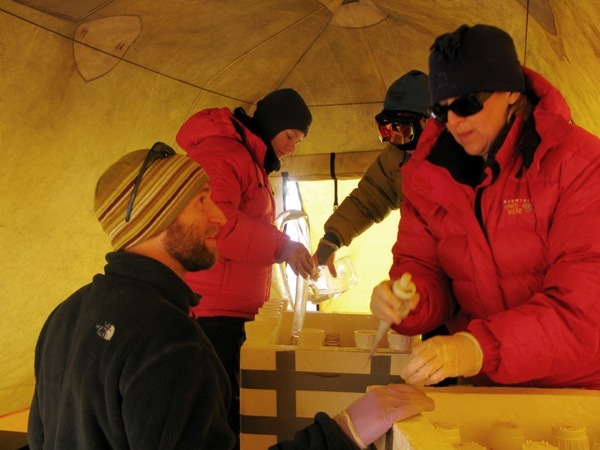 We returned to our ice camp that we had previously sampled on Tuesday. Although we were a little bit disorganized getting going, by a little after nine we were all loaded up and our convoy of snow machines and sleds left building #36. By 9:45 am we were at or ice camp and hard at work sampling. It was a bit colder on the ice today, -17.3°C (~1°F) but it was a magnificent sunny day. The snow and ice were brilliant. Our routine on the ice is now pretty well worked out. After getting all our gear unpacked and installing the generator and pump, the Yager group occupies their tent and begins sampling with the Niskin bottle (See earlier blog entry for description). Meanwhile in the larger tent, the Bronk group get going filling-up theirmany incubation bottles and adding the various labeled nutrients. Bronk group setting up an experiment on the ice. When the Bronk group is finished, Zac and I begin to collect our water samples using the pump. The carboys are then placed in coolers and packed with snow. Then as quickly as possible we load everything back on the sleds and head back to filter all our water. As I’ve mentioned before in this blog, in addition to the three science groups on this trip a middle school teacher and an artist have accompanied us. One of their objectives on this trip is to photograph under the ice and they both came equipped with a variety of cameras to do that. Lollie Garay and Adriane Colburn posing with their under ice camera rig. 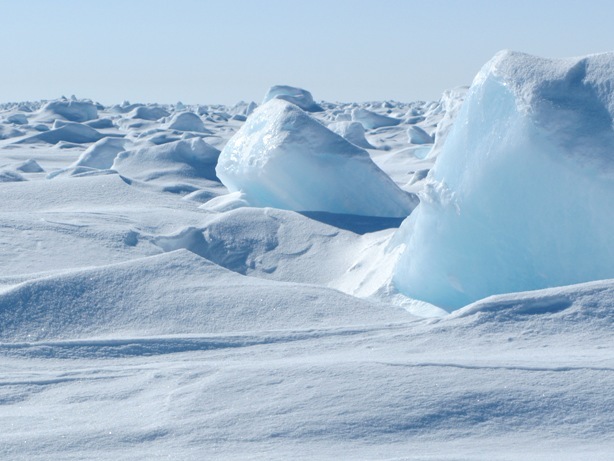 Today on the ice, they were hard at work with several cameras ready to deploy through the ice. 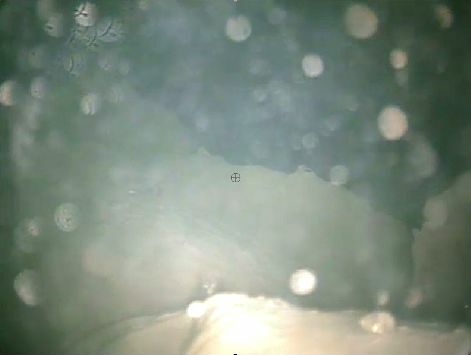 Working from an ice hole we drilled outside of the work tents, they deployed cameras to explore under the ice. I haven’t seen much of the footage yet, but the little bit I have seen is amazing. Hopefully I’ll have some pictures to share later in the week and, as I mentioned before, Lollie is planning to post videos on the project website. 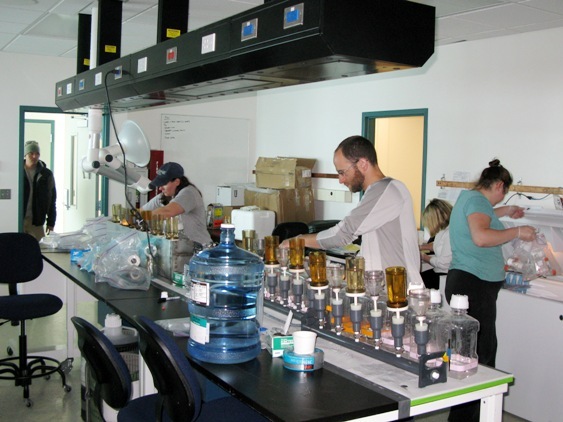 After returning to our labs and processing samples for the next 6 hours we were all exhausted. Since Debbie and I had missed dinner at the cafeteria and can’t cook in our rooms at that Qkpik Nest “hotel,” we decided to go out to dinner at the Brower Café. Zac and two of our logistical support team (Faustine Mercer and Josh Bacon) joined us. Dinner was great (I had Mongolian Beef) and we were rewarded with a spectacular view of the night sun over the frozen ocean.